Eliminate drips to conserve valuable liquids and improve product finishes! 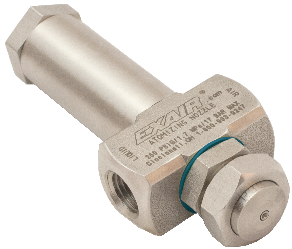 EXAIR’s patented No Drip Atomizing Nozzle provides the same great performance as the the standard atomizing nozzles with the added benefit of positive liquid flow stoppage when the compressed air is shut off. The No Drip option eliminates the occurrence of post spray liquid flow that results in unwanted drips that can mar a finish on painted or coated surfaces. Also, excess liquid loss is minimized saving on expensive materials like chemicals or coatings. When the compressed air is shut-off, the No Drip nozzle positively seals off the flow, eliminating the chance for a drip or lost liquid. Only one compressed air line is needed, as the line to combine and atomize the liquid also provides the no drip operation and control. The No Drip Atomizing Nozzles are available in (3) types – Internal Mix, External Mix, and Siphon Fed. The Internal Mix type operates under the principle that the air and liquid come together and mix ‘internal’ to the nozzle. This type provides the finest atomization and smallest droplet size. The Internal Mix type of nozzle can be used with liquids up to 300 cP in viscosity. Both the air and liquid sides are pressure fed. The No drip Internal Mix Atomizing Nozzles are best for pressure fed applications not requiring independent air and liquid control. The No Drip Atomizing Nozzles are available in (3) sizes – 1/8, 1/4, and 1/2 NPT – to provide a wide range of flow rates and pattern sizes. The No Drip feature does not impact the flow rates compared to the standard models. Minimum air pressure operation is 30 PSIG for the 1/4 and 1/2 NPT, and just 20 PSIG for the 1/8 NPT models. Like the standard Internal Mix Atomizing Nozzles, spray patterns include narrow and wide angle round, flat fan, deflected flat fan and a 360° hollow circular pattern offering a wide selection to best meet the application needs. Operation at up to 180 spray cycles per minute is possible. Air and Liquid Caps can be switched out to change the pattern and flow rates. If you need an Atomizing Spray Nozzle or any of the EXAIR Intelligent Compressed Air® Products, feel free to contact EXAIR and myself or one of our Application Engineers can help you determine the best solution. A steel forging plant was using a releasing agent in their process. This particular operation was to make a blank gear. It started with a heated ingot that was placed in a two-part dual stamp die. The front section of the die creates the hub of the gear, and the back section would finish the outer diameter of the gear. The operator would use tongs to grab the hot part and place it in the front and back portion of the die. Each time the press would cycle, a release agent would be sprayed onto the die so that the parts would not stick. As you can see in the picture below, they had six liquid spray nozzles modified to spray the entire surface. Two of the spray nozzles were blowing the release agent to the top portion of the die, and four spray nozzles would spray the entire bottom portion of the die. Every time the press would cycle, the release agent would be sprayed. At a rate of making a part every six seconds, much release agent was being sprayed. This lubrication for forging was not inexpensive, and it was adding cost to their operation. 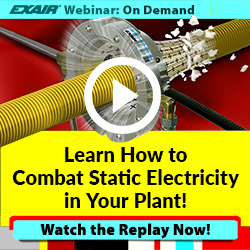 They called EXAIR to see if we could help in this matter. 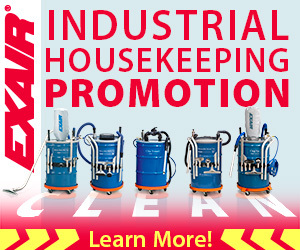 The EXAIR Atomizing Nozzles use compressed air to help “shear” the liquid into a very fine mist. The smaller the liquid particle size, the more surface area is created. This is very beneficial in saving liquid material without reducing the required performance. This customer purchased two Internal Mix Narrow Angle Round Pattern Atomizing Nozzles, model AN1040SS to replace the six liquid nozzles that he was using. With a stainless steel construction as standard, it makes the Atomizing Nozzle very corrosion resistant and able to handle 400 deg. F (204 deg. C) temperatures. With the narrow angle round spray pattern, they could position the Atomizing Nozzles to cover the entire top and bottom of the die (reference the photo below). With the liquid adjustment valve, they could dial in just the right amount of release agent to keep the process running smoothly. After the first week in modifying their operation with EXAIR Atomizing Nozzles, they noticed that they were using only half the amount of releasing agent. This helped to cut cost in their operation, increasing their profit margin. We can spray liquids very economically and efficiently. We have different types of spray patterns for three different styles. We have the Internal Mix style for low viscosity fluids as purchased by the above customer; the External Mix for high viscosity fluids, and the Siphon Fed for unpressurized liquid systems requiring gravity or siphoning. We can atomize liquids up to a rate of 5 gallons per minute (19 liters per minute). If you believe that you are going through too much liquid in your process, you can contact an Application Engineer to see if we have the correct Atomizing Nozzle for you.